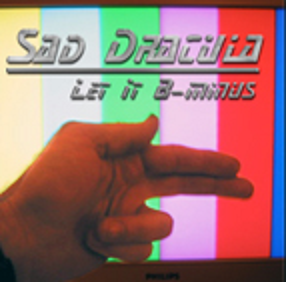 Bootlegs: Sad Dracula (Ryan Adams) – "Let It B-Minus"
Ryan Adams can be too hard on himself. Let It B-Minus may not be his highest-graded collection, but the sessions certainly deserved release beyond his Web site, circa 2006, where it emerged alongside goofball, Garage Band-y albums under his monikers DJ Reggie and Warren Peace. But Let It B-Minus, recorded as Sad Dracula, is a more serious affair. An homage to the Replacements’ album of the similar name, Let It B-Minus was recorded in the faded style of Cold Roses and played with the Danzigian fury of Rock N Roll‘s heavier moments. Over 27 minutes, it spans much of his range — “Actors on Actors” is up there with his most wistful work, while “4th of July” winks at the Strokes with its down-stroked guitars. It’s a loud, loose record that makes even its sillier stuff — the mid-album block of “Temporary Vampire,” “Steve Miller & Weed” and “Be Careful” — more immediate (and less self-conscious) than, say, “Halloweenhead.” As the slow-cooked sound of Easy Tiger and Cardinology unfortunately proved, Ryan’s at his best when he’s reckless and on the run. Whatever its failings, Let It B-Minus is a fearless record — hopefully not his last.